Ready-made fabrics are chosen focusing on a combination of three distinct elements—type, texture and colour. faAB HomeFashions has over 350 fabrics for you to choose from. Type: Natural fabrics, silk, linen, cotton are valued for their inherent qualities—luster, texture and hand. They provide cloth with interesting inconsistencies, slubs and colour variations which add to the look and feel. While man-made fibres offer durability and consistency. Plus, with today’s technology, man-made fibres can be woven, dyed and manipulated to resemble, with uncanny realism, all of the natural fibres. Texture: Draperies can be the easiest and simplest way to change the personality of a room. Fabric with textures like slubs, sheen, pile and woven patterns add inherent value and personality . Colour: The source of inspiration! Soft tones chosen to match the rooms overall colour palette can make the space cohesive. Contrasting or strong colours, chosen from a spot of colour in a rug or upholstery fabric, can make the draperies the instant focal point of the room and add an exciting shot of colour. Ready-made draperies can be used effectively to decorate, to insulate, to disguise or to enhance. For many centuries it has been synonymous with luxury but today, silk is readily available and affordable. With fine woven silk, the richness is apparent on the luxurious surface and silk takes dye so superbly that it sings with colour. 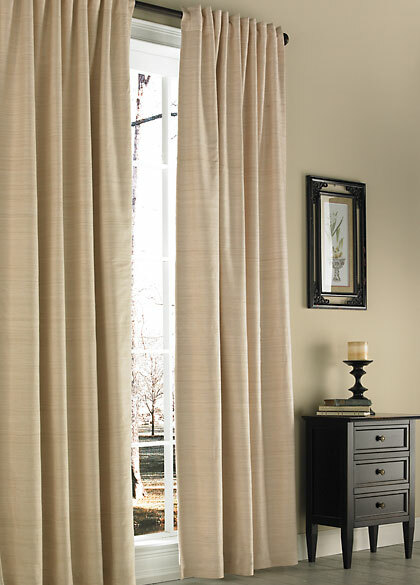 Plain woven silks, or slubbed silks, give drapery panels a shimmer that provides a rich effect when hung on the window. And silk fabric is so finely woven that the fabric falls in sculpted folds under its own weight. Shot silk appears as one colour from one position and different from another view. This is achieved by weaving the warp and weft in contrasting colours, (examine the cut edge to see which colours have been combined). Silk is a delicate fabric so drapery panels must be fully lined using superior quality blackout lining to protect from damaging sun and moisture. Linens have a crisp matte finish and feature a slightly coarse surface. Traditional linen colours are often naturals in soft taupe or bleached linen in soft whites. A linen drapery has a natural crispness which gives it fullness and body when hung. Produce practical, strong fabrics with their intrinsic value coming from their intricately woven patterns. Blends make natural fibres like cotton and linen more durable. With blends the interest is produced with either a self- patterned basic weave or a multi-weave pattern. Fabrics without patterns get their surface interest from the blending of colour and texture. Light has an effect on these fabrics and brings self-patterned, single-colour fabrics to life. The type of weave also influences how the colour appears, as it affects the density of the dye. Fabrics with sheen will seem brighter and more dense in tone than unglazed matte fabrics. Cut pile fabrics like velvets and chenille have a soft, noticeably raised surface. The texture is made from rows of loops set on a simple ground and cut. The direction of the pile and the way that light hits it affects the colour which can change from deep and shadowed to shimmering and lustrous. Velvets can be woven using silk, wool, cotton and blends, and are versatile and very hard wearing. Velvets and chenille are traditional fabrics for draperies offering weight and warmth to a room. Sheer or semi-translucent fabrics are woven with the finest of threads. This allows light to travel through the fabric yet diffuses the view to the outside for privacy. These lightweight fabrics are best used with substantial fullness. Traditional sheer fabrics were made with muslin but today, most ready-made sheer draperies are made from man-made fibres for drapability and durability.